Season Three: "towers of zenith, part two"
a.k.a. "towers of zenith (part two)"
The takeover fails, but Michael and Elliot manage to retain their jobs. While Minnesota Brands begins analyzing how best to take over D.A.A. Michael is having a bathroom installed into his office. Miles invites Michael to go with him to talk to Duncan Arthur's widow (a major shareholder) and make sure that no one from Minnesota tries to talk to her. Hope asks Michael if he's over some ethical line and he quietly assures her that the ends justify the means in this case. Carol Arthur drops into the office unnanounced just to throw Miles off guard and show that she's figured out that Minnesota Brands might be making a move. While Michael and Mark meet, Jennifer, the plumber installing the bathroom, comes in to work. Michael brings Mark into the conspiracy and while talking to Gus on the phone, Michael comes to realize how much is at stake--his whole job and career. Nancy and Hope have lunch and Nancy tells Hope that she's meeting Matt Enright, her old boyfriend, for lunch to tell him about the cancer. Michael pokes around Miles' office and is nearly caught by the secretary. Miles shows up and calls up a Gabriel Rivera, which Michael picks up on--perhaps Rivera is the white knight in the takeover. Michael and Mark go into an espionage fit and while Michael calls Gus Hennessy, Mark goes out to follow Miles. When Gus won't take his call, Michael calls Elliot and sends him to Rivera's address. Mark and Elliot run into each other while on the trail of Miles and team up, only to discover that Rivera is a dentist doing emergency work on Miles. At home, Michael receives a package from Gus containing a scrambled cellular phone and some Snap Happys. At the office, Jennifer the plumber is eating lunch at Michael's desk. Miles calls Michael in to help monitor Mark's lie detector test (a complete surprise to everyeone). Michael takes the bull by the horns, pointing out that he can't test a black man first and volunteering to go first himself. It works and Miles backs off. Miles then cooks up the idea of sending Michael to meet Jack Ashley and win his support for Miles. Michael packs to go out to California with Elliot on behalf of Minnesota Brands. Jack Ashley seems quite nice at first, but it becomes progressively apparent that he's completely nuts. Michael realizes that he's been setup just as the phone rings and it's Miles, calling to say that he's gotten a deal with Carol Arthur and now owns enough of D.A.A. to defend against any takeover. Hope is quite supportive when Michael reports the news. Spano shows up in the parking lot again and apologizes to Michael for putting him on the line, then says there can be a place for him and Elliot at Minnesota Brands. It's lightning and storming horribly when Michael gets into the building and sees Jennifer leaving, but dressed very nicely--she apparently is both literally and metaphorically, a "plumber" and spied on him for Miles. Miles begins to wax philosophical, but eventually gets around to the point that he's not going to fire Michael since he thought the move was bold and gutsy. As he's leaving, Michael demands for Elliot's job back and Miles acquieses. Elliot and Michael have beer and pizza at the office and rejoice in their good fortune under the circumstances. Ashley's nickname for Miles was "The Mortician"
Timothy Busfield belts out a line of "The Impossible Dream" (Man of LaMancha score by Mitch Leigh and Laurence Rosenthal) as he's headed off toward a "spy group" meeting. Jennifer the plumber (played by Beverly Mickins) hums "On the Banks of the Wabash" (a ballad of the Spanish American War, written by Paul Dresser in 1897)as she tries to work. This tune is a special trademark of director Joseph Dougherty and he drops it into his productions whenever he can. 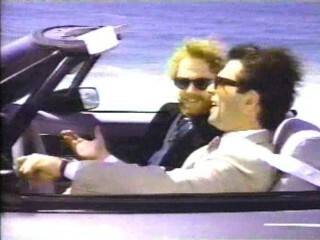 An unidentified tune plays over the convertible radio as Elliot and Michael drive to meet Ashley in California. See "towers of zenith" part one ("the go-between") for points of analysis that apply to both episodes. [4/29] Just how much time has passed between parts one and two? In part one, Michael's office was fine, and suddenly there's sheetrock and construction everywhere as a bathroom is being installed. I guess that this all makes sense, but A) what happened to the cool soundtrack, B) how many people got the plumber joke (cf. All the President's Men), and C) would Miles really be that forgiving? I see the logic and I follow it, but this generous, rational disposition is coming right on the heels of his extremely shortsighted, spiteful, and Machiavellian disposition of the previous week.